I've been after a new purse for as long as I can remember now as my current one is a bit tatty and old. I spotted this one whilst browsing around Primark for the bargain price of £5.00 so quickly popped it in my basket. 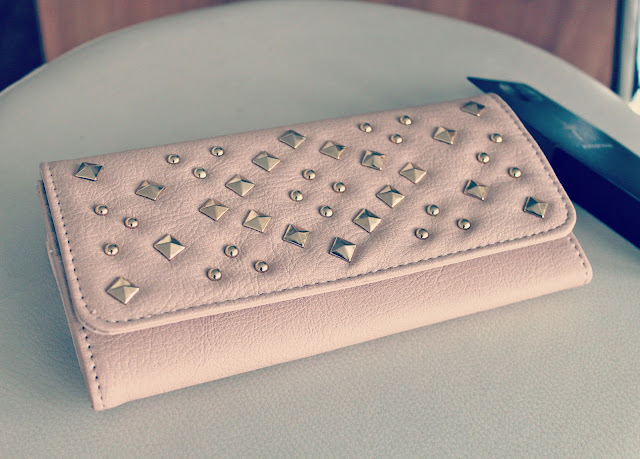 I love the studs on the front (I'm a tad stud obsessed) and its very roomy inside with various compartments for cards, change and notes (not that I ever have any of those babys!). It feels lovely quality too considering its from Primark so I'm chuffed to bits with this purchase. 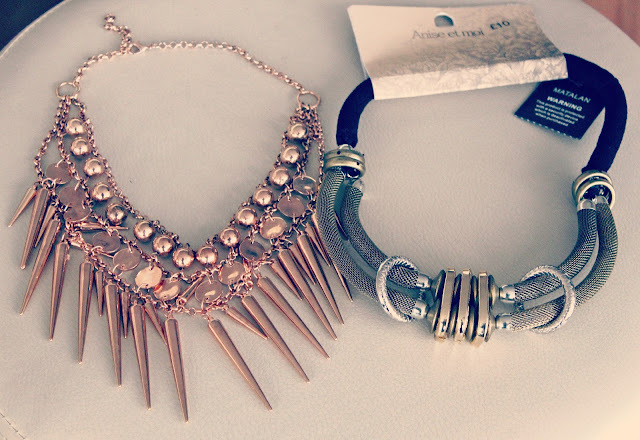 I'm obsessing over statement necklaces at the moment so these were must-haves as soon as I saw them. The one on the left is from River Island and I particularly liked the Rose Gold colour as I thought it would match my rose gold Michael Kors watch perfectly. I've been wearing it all the time since I got it and love it for sprucing up a plain t-shirt or blouse. The other necklace is from Matalan and this has to be one of my favourite purchases in a long time. As soon as I saw it, I had to have it, no hesitations. I've seen these chunky necklaces all over at the moment on other bloggers and celebs so I just knew I had to have one too (I'm easily influenced!). 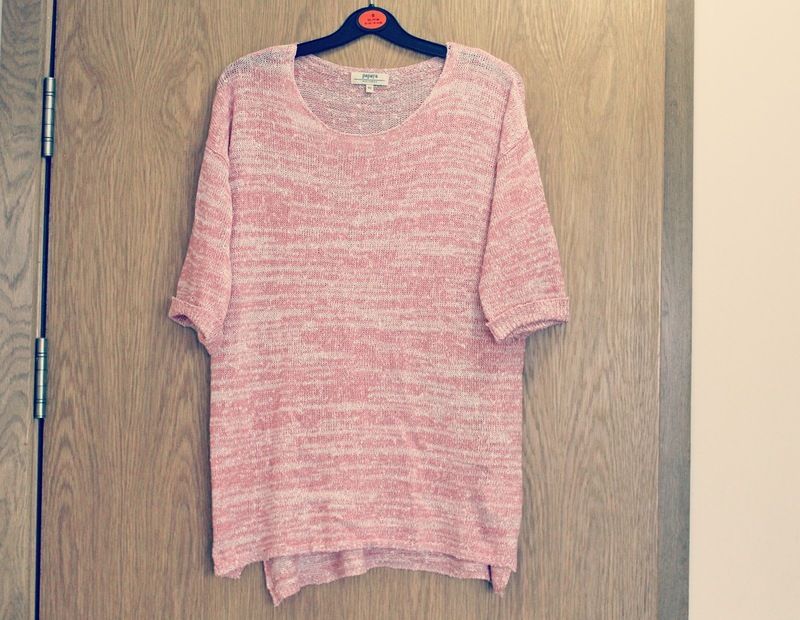 I've also seen almost identical ones in Topshop for £20+ so for £10 it was quite the bargain. I wore it for the first time at the Benefit 'Fake Up' event on Wednesday night and all of the Benefit girls told me how much they loved it and said it was very 'Kardashian'. I have to say - I agree! 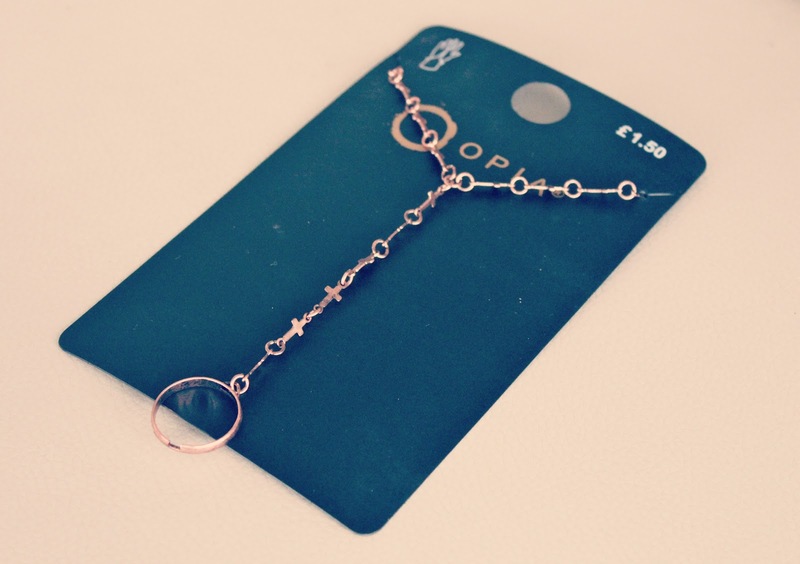 I also got this cute ring bracelet from Primark for a bargain £1.50. I love these type of bracelets as they're a little bit different and look great on a night out. Its made from cute little crosses and its Rose Gold too - what more could I ask for? Okay so as soon as I saw these beautiful tan ankle boots in Primark, I HAD to have them. I mean just look at them, they are amazing (if I do say so myself!). These will be just perfect for Spring/Summer and I can already see myself wearing them with cute little skater dresses. 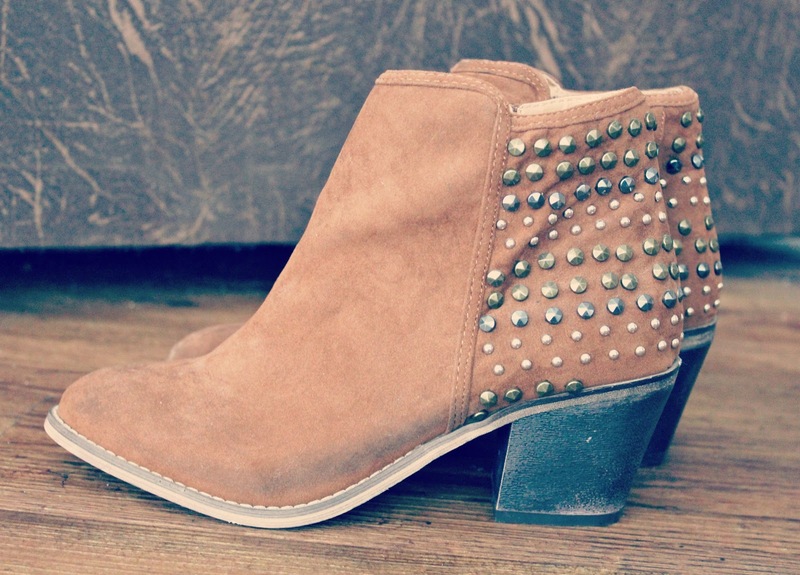 I'm a bit obsessed with all thing tan when it comes to S/S so these boots are the perfect addition to match my other tan handbags and acessories. I've already been wearing these (also to the Benefit Fake Up event) and I just adore them. They're so comfy, easy to wear and I love the studded detailing on the back. They cost £20.00 which is on the pricey side for Primark but I'd of probably paid double for them elsewhere so I think they're quite the bargain. I will definitely be wearing these none stop over the next few months. 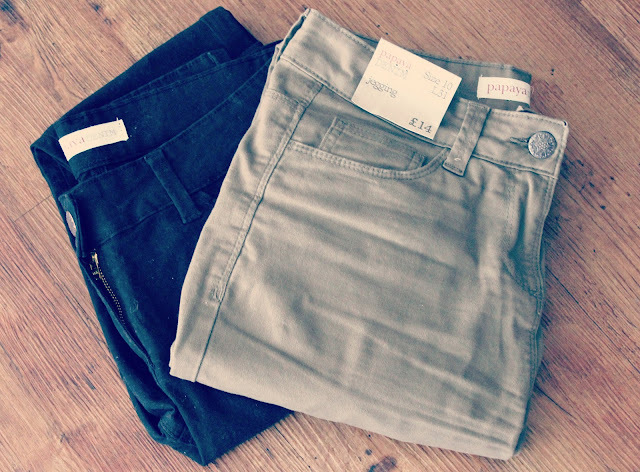 As soon as I walked into Matalan there was a table of these 'jeggings' in tonnes of different colours. I'd been after some new jeans for a while so I decided to try the khaki pair on. I thought khaki would make a great S/S colour and I also loved how soft the material material felt. I'd definitely say these are a dupe for the Topshop 'Leigh' jeans, a very soft, comfy material that isn't quite as stiff as your standard jean. When I tried the Khaki pair on I loved them so much that I just had to pick up a black pair too. They only cost £14 which is an absolute steal and I can see myself collecting these in every colour! This blouse immediately jumped out at me when I stepped into Primark thanks to the beautiful green shade. I instantly thought of Spring when I looked at this shirt and I thought it would be a great S/S wardrobe addition. I've already worn it with a statement necklace (theres photos over on my instagram - kayleighjcouture) and I've also worn it to work tucked into a pencil skirt. Its definitely a 'stand out' shirt but if you're looking to add some colour to your wardrobe, grab yourself one of these beauties. I can also imagine this looking perfect with Essie 'Mint Candy Apple' nail polish, ooohh! 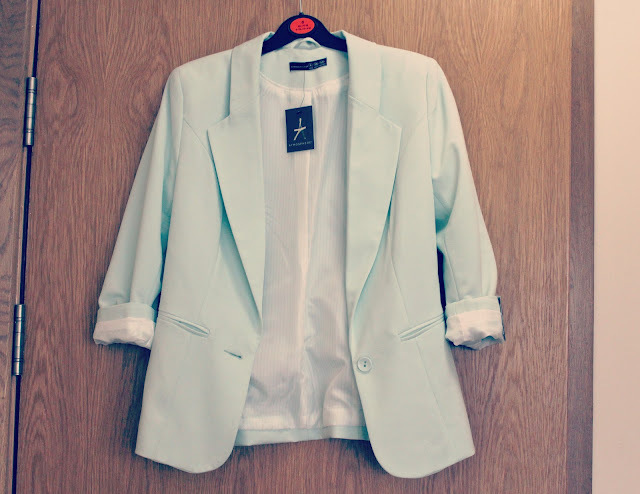 Following on with the green theme, I also picked up this mint green blazer. I already own one of these in a burgandy shade but now Spring/Summer is approaching I wanted a lighter alternative to wear with all the pretty pastel clothes I'll soon by buying (any excuse!) 8). If you haven't tried one of these blazers before, I'd really recommend them. They're great quality, comfortable, don't crease and best of all - cheap! Well, I think it was £19.00 actually which isn't cheap for Primark but still cheaper than most. Oh so you know how I was just saying I'll soon be buying pastel clothes? Well it looks like I've already started, whoops! This was another 'I need it' items when I walked into Matalan and I'm so glad I bought it as I've been wearing it none stop since. Now although I've described this as a jumper, it isn't your typical 'to keep me warm' kind of jumper. This one is perfect for the warmer months as its sheer, floaty and ideal for throwing on over a vest top. I've been wearing it with the Khaki jeans, tan boots and 'Kardashian' style necklace mentioned earlier and it makes for a super cute Spring outfit. I also think this will look great tucked into a pair of high waisted short when Summer rolls around. I bought this cute monochrome bodycon dress for a recent night out with friends and I absolutely adore it. It fits me perfectly and I love the cut-out detailing around the neckline and the open back. 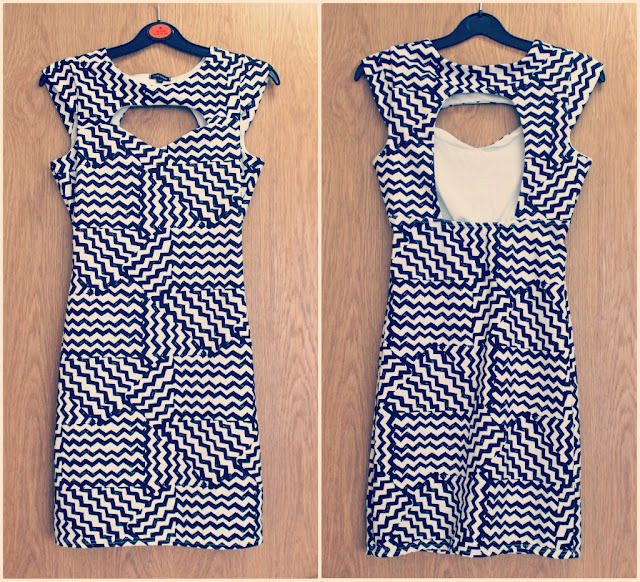 It was only £25.00 which isn't too bad for River Island and I can see it being a perfect holiday dress too. I'm excited to wear it again when Summer comes around. 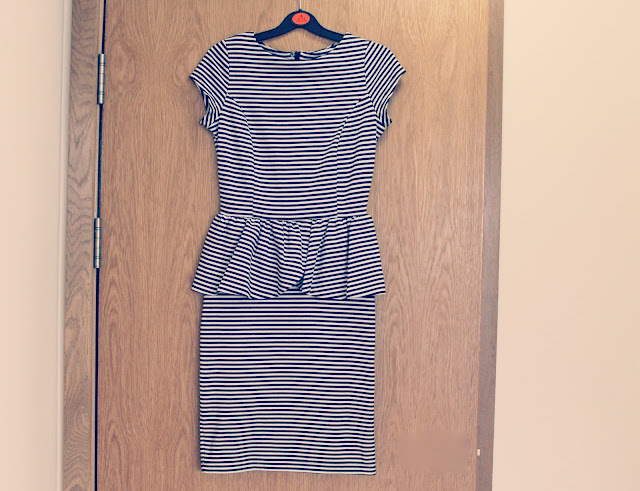 Last but not least is this black and white stripy peplum dress that I bought to wear for work. I spotted this in Matalan for the bargain price of £15,00 and just had to have it to add to my work wear wardrobe. 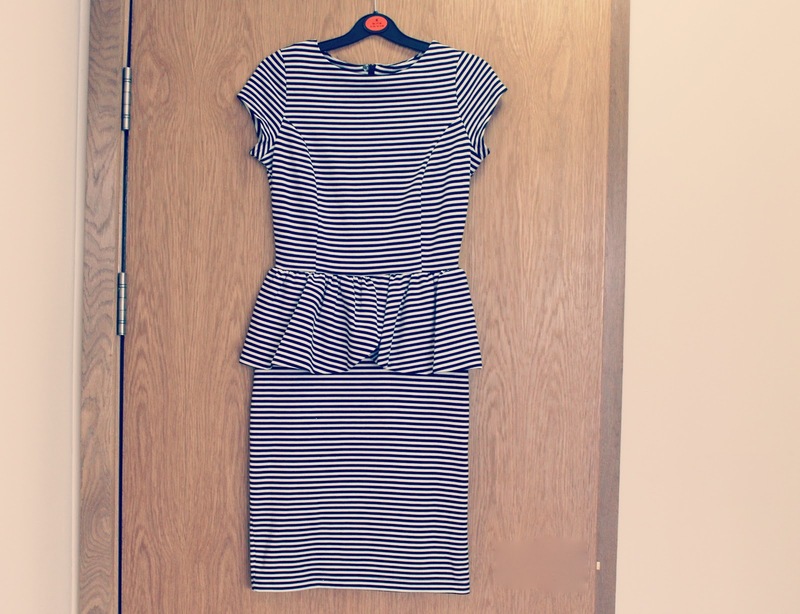 I love wearing smart dresses like this with tights for work and the peplum design is really flattering. I've already worn this a few times to work and had some lovely compliments on it so it was definitely a good choice. 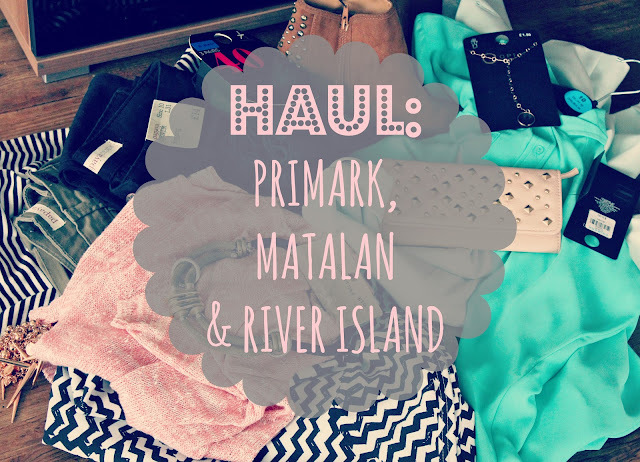 So there's all of my recent purchases (well apart from all the makeup, a Topshop dress and a Missguided jacket but we'll leave those for another time haha!). Shopaholics anonymous anyone? the primark shirt and matalan dress - they are amazing!! Fab haul I want it all, esp the tan boots, wow, they're gorgeous! Love that green shirt! Will look amazing with your blonde hair! Love that green shirt and I just commented on someones blog who bought that Topshop necklace which you got a matalan dupe of! I went in Matalan this afternoon and very nearly picked those jeggings/jeans up but I wasn't sure on the sizing! Do they come up quite small? Oh i LOVE the monochrome dress from RI - so gorgeous! And i know what you mean about primark becoming a little pricier than normal, its a shame but as long as the quality of the clothes is going up aswell as the price, its not too bad! 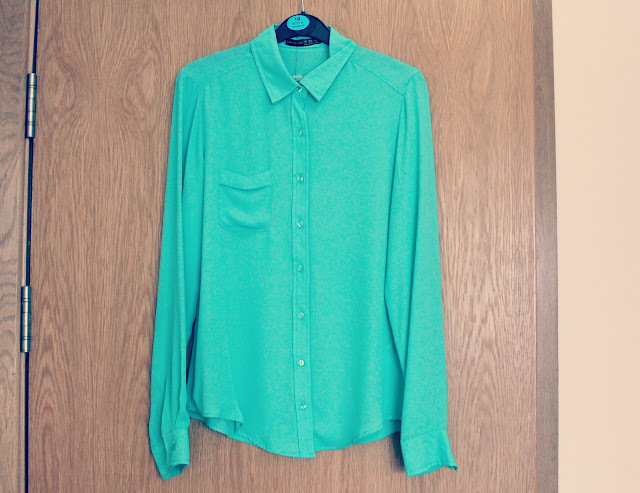 I really love the colour of the blouse from Primark and that necklace from Matalan is gorgeous! Love the tan boots and the mint green blazer!!! I love reading haul posts, I don't know why but it makes up for me not being able to spend money! haha! Great haul, I actually love everything you have bought, but my top favourite has to be those necklaces! I'm so into statement necklaces right now! Nice haul! I really like the dresses! The necklace and boots! Ahhhh so gorgeous. Great haul. Great haul! I love the green shirt and blazer, so cute and I love green. 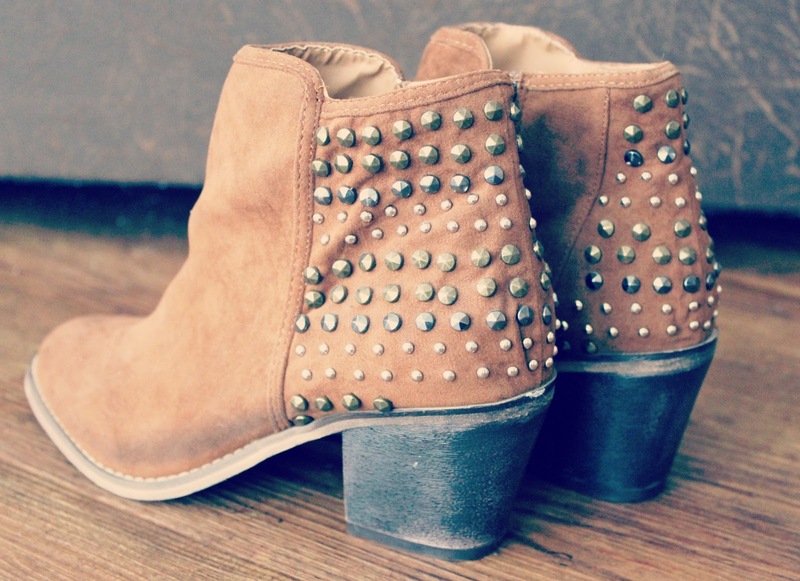 Those boots look amazing and it's nice to hear that they're comfy too! The rose gold necklace is to die for!! Love the studded purse and mint blazer! Great pieces. Great haul! I love the necklaces you got! Really nice haul! I bet the Primark blouse will look on, it's so lovely and bright! I love the statement necklaces. in love with that balck and white dress from River Island! eek you always buy so many nice things missy! beautiful pieces! love the rose gold spike necklace and the mint green blazer! so pretty! Wow I love the River Island monochrome dress!! They look like they are from River Island!